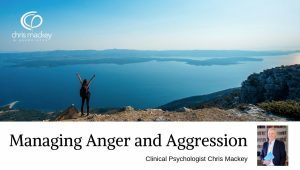 Clinical psychologist Chris Mackey discusses how to manage with strong feelings of anger and aggression. If you are experiencing persistent feelings of anger or outbursts of aggression, it’s important to do something about it. Anger can stem from a number of sources including unrealistic expectations of yourself or others, a win-lose attitude towards conflict, or a perceived need for revenge. It can be important to learn to leave a situation rather than act with aggression, to learn strategies to reduce arousal, and to develop more effective ways to assert or express yourself that still show respect to the other person.